You know what makes me happy? Learning. I love understanding how the universe works, what makes people do the things they do, and figuring out how to improve myself. It gives me deep satisfaction. That's why I felt quite pleased with the results of my happiness research, which taught me a lot about happier workplaces. The Happiness Advantage by Shawn Achor, Stumbling on Happiness by Daniel Gilbert, The Happiness Hypothesis by Jonathan Haidt, Delivering Happiness by Tony Hsieh and many online articles gave me plenty of insights during my research. I synthesized the results and created what I call the 12 steps to happiness. 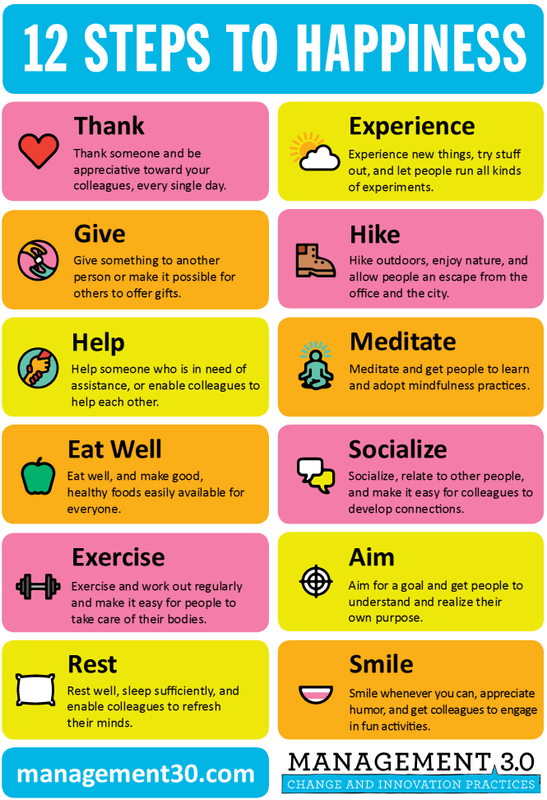 Those are the 12 steps to a happier workplace. I suggest you keep them in mind every day! Download the poster and put it up on the wall. And when you thank me for it, you will have already started properly.